There’s a new silver bullion series out from KOMSCO that highlights the Twelve Guardians of Korean cultural lore. The series will feature a total of 12 medal releases, each one with a unique design depicting a different warrior commander from the Zi:Sin. The 2017 1 oz Silver South Korean Zi:Sin Gallus Medal is the inaugural release and is now available to you for purchase online at Silver.com. Ships to you in protective plastic, mint tubes of 25, or sealed mint boxes with 250 medals! First medal design released in the Twelve Guardians (Zi:Sin) Series! Mintage limited to 33,000 medals only! Obverse features the image of Do ggae bi from Chiwoo Cheonwang’s shield. Reverse includes the design of Gallus, the messenger of light. The Zi:Sin are known as the commanders responsible for leading god’s armies into battle when the forces of evil rise up. Whether god must wipe out demons or cleanse the world of a plague, it is the Zi:Sin responsible for leading the way on the ground. There are Twelve Guardians to guard the twelve directions, with the initial release of Gallus facing direct to the west directionally. Gallus is the messenger of light who possess the ability to summon a light as bright as the sun. When he displays this light, the demons from the dark side cannot withstand its shine and would not hesitate to run from the field of battle at the sight of his bright light. He also possesses a powerful roar that strikes fear in the heart of any who hear it. His tall helmet is said to give him the power to foresee events in the future. 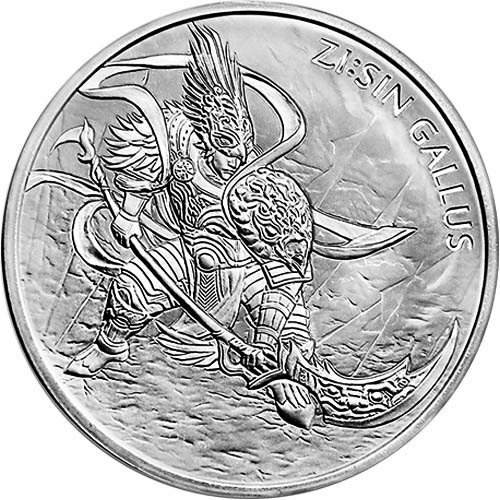 On the reverse of the 2017 1 oz Silver South Korean Zi:Sin Gallus Medal is the image of the messenger of light, Gallus. His figure is shown on the field of battle wearing a full suit of armor and wielding a large, destructive spear. The only engravings on this face in text identify the Twelve Guardians and this specific release, with “Zi:Sin Gallus” engraved on the right side. 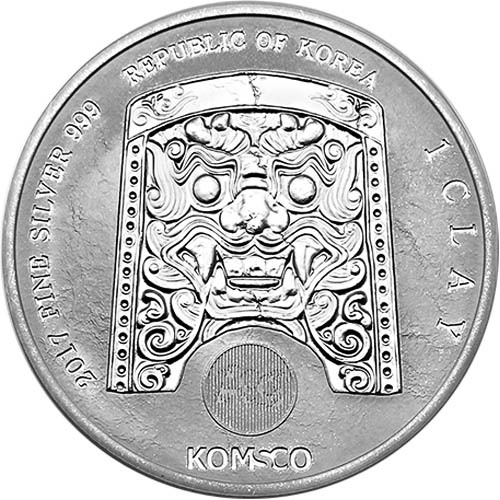 The obverse of all Silver South Korean Zi:Sin Gallus Medals features the head of Do ggae bi. Though he possesses grotesque looks, he is simultaneously humane and humorous in appearance, but his purpose was dependent upon his grotesque looks. Akin to the hob-goblin of Western cultures, Koreans would hang the image of Do ggae bi on the ends of roof tiles to chase away evil spirits. 2017 1 oz Silver South Korean Zi:Sin Gallus Medals are in BU condition. Products in BU condition have no signs of wear and tear, but may feature minor flaws like breaks in the luster, spotted surfaces, or contact marks. We encourage all Silver.com customers to contact us with questions. You can call us at 888-989-7223, chat with us live online, or simply send us an email with your inquiries.